The Carson Water System serves approximately 2800 people in the unincorporated community of Carson and the area extending approximately 3 miles north of High Bridge. The system is served by both surface water and groundwater sources. Bear Creek surface water withdrawals are treated by the Carson Water Treatment Plant. The Bear Creek source is supplemented by 300 gallons per minute of groundwater production supply from the Industrial Site Well. 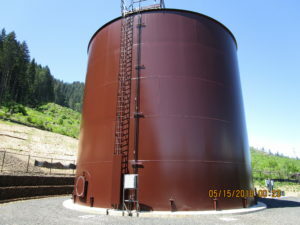 The 750,000 gallon Carson Reservoir and 90,000 gallon Industrial Site reservoir provide water storage with system level booster pumping to maintain minimum operating pressures. Distribution system water mains range in size from 4-inch through 12-inch in diameter. PVC and steel are the principal pipe materials. Brooks Reservoir – Skamania PUD has completed construction of a new 400,000 gallon reservoir in the Carson Water System to improve water reliability, provide added water storage and additional fire protection for the community south of the High Bridge. The Underwood Water System serves approximately 1000 people and draws its water from Galligan Springs, Shaddox Springs, and Galligan Well. All three sources are either pumped or delivered by gravity to a combined source pump station which delivers water to the distribution system. The system is served by six reservoirs with a combined storage capacity of approximately 520,000 gallons. The system is segregated into four different pressure zones. Within each pressure zone are additional sub-zones created by pressure reducing valves. Distribution system water mains range in size from 4-inch through 8-inch in diameter. PVC and steel are the principal pipe materials. Shepeard Pump Station and Reservoir – The Shepeard Reservoir and Pump Station Project is constructing a new water storage reservoir and new pump station to replace the existing, aging facilities that were constructed in the 1950s. The project will increase capacity and reliability for the Underwood Water System as well as improve the water system’s disinfection facilities and communication capabilities.